Barcelona will look to secure a place in the last four of the Champions League as they host Manchester United on Tuesday night. The Catalan giants hold a 1-0 advantage from the first leg at Old Trafford in their quarter-final tie, and are now considered strong favourites to complete the job at home. However, United remain a threat as Ole Gunnar Solskjaer’s side know that they can cause their rivals problems after the first meeting, despite failing to register a shot on target. With the pace, movement and quality that they have in the final third though, they could be a handful on the counter-attack and that is something Barcelona will have to prepare for and nullify. After being rested at the weekend, several key stalwarts are back in coach Ernesto Valverde’s squad, as seen in the club’s tweet below. Lionel Messi, Luis Suarez, Sergio Busquets and Gerard Pique were all absent in the draw with Huesca, but they all return for this crunch showdown. Ousmane Dembele also gets the nod as he continues his recovery from an injury, and after featuring on Saturday, the Frenchman is ready to provide Valverde with another key option in attack to pose a different threat to the Red Devils. The 21-year-old recovered to make the bench in the first leg, but having now got minutes under his belt after missing four consecutive La Liga games with a muscle injury, he’ll hope to play a more prominent role. Based on the reaction below, it’s fair to say that many Barcelona fans are delighted to have him return to the fold, and they’ll hope that he can prove to be decisive to seal their place in the semi-finals having bagged 14 goals and eight assists in 36 games so far this season. 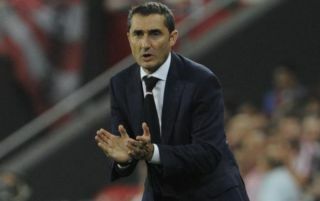 It’s a strong squad for Barcelona and Valverde, and few will go against them securing the result they need to advance. @Dembouz @LuisSuarez9 do it for Barcelona ?? ?